Wayne Rooney celebrates his 100th international cap against Slovenia this weekend. His efforts for England over the past 11 years have come to bear 43 goals and a swagger of records to impress a truly astounding career. 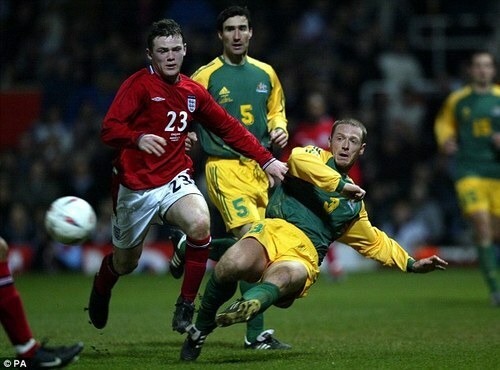 100 games ago, Rooney began his international career against Australia featuring the likes of Harry Kewell, Mark Viduka, Josip Skoko and Mark Schwarzer who were all intent on giving the motherland a good run for their money. The kindling of an Australian golden generation delivered an unexpected surprise to then English manager Sven Goran Eriksso of what the full Socceroo potential really entailed. Before Rooney at just 17 years and 111 days stepped foot on the pitch, the Socceroos were taking it up to a troubled England. Their “awful” and “embarrassing” opening performance left them looking down at a two-goal margin and a battering from the local press. The Socceroos kicked off a brilliant first half through Tony Popovic. A reckless Paul Scholes tackle gifted a set piece to whip into a box full of Aussie high-flyers. Popovic finding the space the unmarked back post and easily nodded it into the next unchallenged by the keeper. A much younger looking Harry Kewell also decided to join in on the scoreboard showing off his amazing talent to beat Rio Ferdinand, side step the keeper and slot it into the back of the next. The unexpected lead at the 45 minute break and an underwhelming performance saw Goran Eriksso switch the whole starting 11 with a fresh set of Englishmen lead by a very young Wayne Rooney. Immediately his impact was contagious. Rooney playing the link to string together beautiful forward movements allowing England to pull one back. Though the rapturous reaction to this youngsters ability was short lived. John Aloisi linking up with Brett Emerton on the counter attack to find the back of the next and sink England’s hopes in the process. The final 3 – 1 scoreline marked the beginning of a golden team and a legendary player.